Policy and management decisions are often made on financial grounds. However, the economic value of the benefits that people derive from ecosystems, that is, ecosystem services, may not be fully recognised and hence ecosystem considerations may not be incorporated adequately into decision-making processes. This is particularly true for regulating services, the benefits obtained from the regulation of ecosystem processes, the valuation of which requires an interdisciplinary approach. In essence, valuation is a problem solving strategy and a problem is a problem, it does not respect the boundary of any particular discipline. The valuation of regulating services is an evolving field of ecological economics. 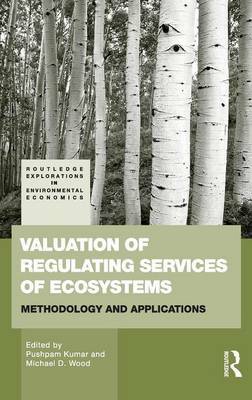 In this book, Dr. Pushpam Kumar and Dr. Michael D. Wood have invited some of the foremost international experts in the field of ecosystem services valuation to contribute chapters on the valuation of regulating services and highlight some of the main obstacles to the implementation and acceptance of these methodologies in the context of decision-making. The contributors explore the theoretical underpinning of valuation of ecosystem services and demonstrate ways in which these theories can be applied to case-specific problems in order to inform decision-making processes. This collection clarifies some of the doubt and uncertainty regarding the valuation of regulating services. Innovative methodologies in this field have started to emerge and in coming years there may be much further discussion on this topic as methodologies and understanding continue to evolve. This is a highly active area of interdisciplinary research with far reaching social and environmental implications, and this book should be of interest to those who are new to the field, as well as established experts, in moving both theory and practice forward.